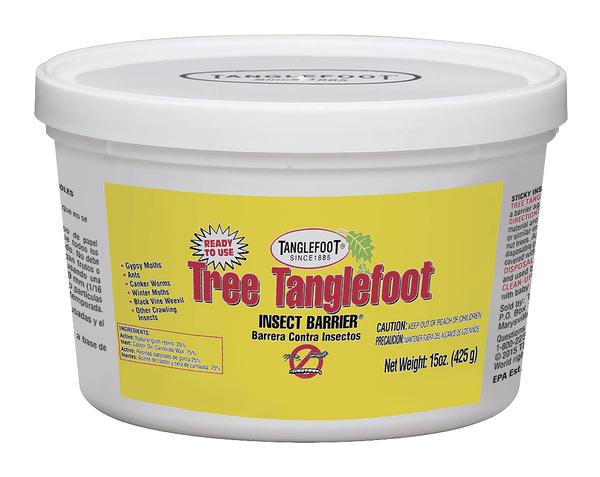 Keep destructive bugs at bay with Tree Tanglefoot® Insect Barrier. This super- sticky, non-drying compound makes it impossible for pests like cankerworms, gypsy moths and other crawling insects to climb into your trees. The long- lasting compound works all season long. For the best results, use with Tangle Guard Banding Materials for easy removal. Looking for natural products? Tree Tanglefoot® is even OMRI rated and certified for organic gardening. 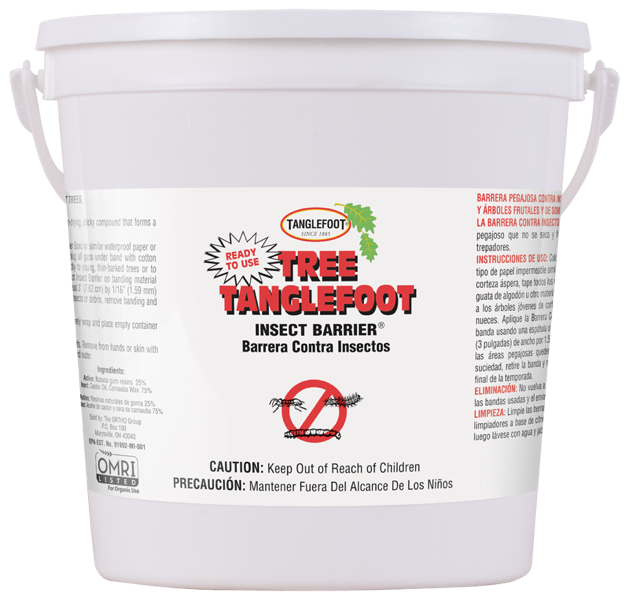 Tree Tanglefoot is oil-based and the oils will soak into the bark. Banding material eliminates staining of the tree and offers quick, complete removal of the sticky material. In addition, Tree Tanglefoot will remain sticky longer when applied on top of a surface resistant to oil. For rough bark trees it may be necessary to plug the gaps between the tree trunk and the banding, this can be done by using insulation or other materials. Apply Tree Tanglefoot Insect barrier in a uniform fashion. It can be applied in a heavy or light coat. Heavy coats are approximately 3" wide and 3/32" thick. A heavy coat is used when the insects kept from the tree foliage are large or numerous, or when there is little time available to maintain the band. Light coats are 3" wide and 1/16" thick. A light coat is good as a general barrier against smaller or less numerous insects, or when the band can be maintained regularly. Generally, Tree Tanglefoot will remain sticky and effective until it is covered with insects, dust or other debris. A build-up of debris or insects will create a bridge for other insect to cross. This debris requires removal and possible re-application in spots. If an area is unusually dusty or the surface of the barrier is stiffened, Tree Tanglefoot can be rubbed around to expose a new sticky layer beneath. Remove bands at end of season. 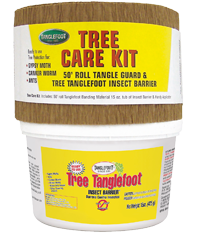 Before applying Tree Tanglefoot, we recommend wrapping the tree trunk with Tanglefoot Banding Material for easy removal. ©2019 The Scotts Company LLC, all rights reserved. ® & ™ denote trademarks owned by or licensed to The Scotts Company LLC, its affiliates, or partners.